- The addition of Ortofon’s unique Replicant 100 stylus and reduced tip mass ensures open and detailed sound reproduction for a purely exquisite listening experience. - Electrum coils, consisting of a gold and silver alloy, provides uncolored and precise transmission of armature movements while the slightly modified damping system makes it possible to reduce VTF and achieves a higher level of linearity. - High purity 6-nines copper wiring ensures impeccable signal transmission and preservation of the finest of microdynamic detail. Listeners who wish to mount the SPU Royal N on a traditional headshell may do so by using SPU N adaptor. 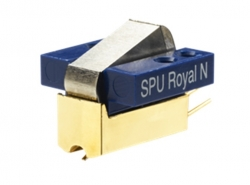 Those with vintage SPU-type headshells can use the Royal N to recreate an authentic and functional SPU cartridge. NB: Vintage SPU-type headshells are no longer available.